Who > H - L > James, Nella "Nellie"
Nellie James, the third child born to Sylvester and Mary Ann Perkins James did not live a long life. The family lived in the Salt Lake First Ward when Nellie was born. She was blessed on September 1, 1871 by Joseph Warburton. In 1882, at the age of ten, she and two of her older siblings, William Henry and Esther Jane, were baptized. The place of the baptism is not recorded, but many Salt Lake children were baptized in City Creek. It is possible that Nellie, her brother, and sister were baptized there. Church of Jesus Christ of Latter-day Saints, Record of Members Collection. Salt Lake First Ward. CR 375 8, box 2168, folder 1, image 59. Church History Library, Salt Lake City, Utah. Salt Lake City, Utah. Cemetery Records, 1848-1992. Nellie James. Database. Ancestry.com. Salt Lake County, Utah. Death Records, 1908-1949. Nellie James. Database. Ancestry,com. United States. 1880 Census. Utah Territory, Salt Lake, Salt Lake City First Ward. Church of Jesus Christ of Latter-day Saints, Record of Members Collection, Salt Lake First Ward, CR 375 8, box 2168, folder 1, image 59, Church History Library, Salt Lake City, Utah. Record of Members Collection, image 59. Salt Lake County, Utah, Death Records, 1908-1949, Nellie James, database, Ancestry,com. 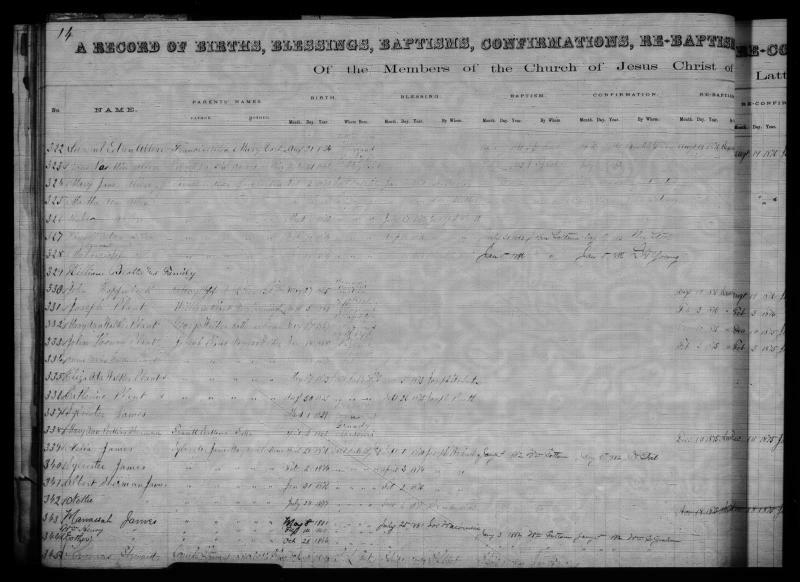 Salt Lake City, Utah, Cemetery Records, 1848-1992, Nellie James, database, Ancestry.com.